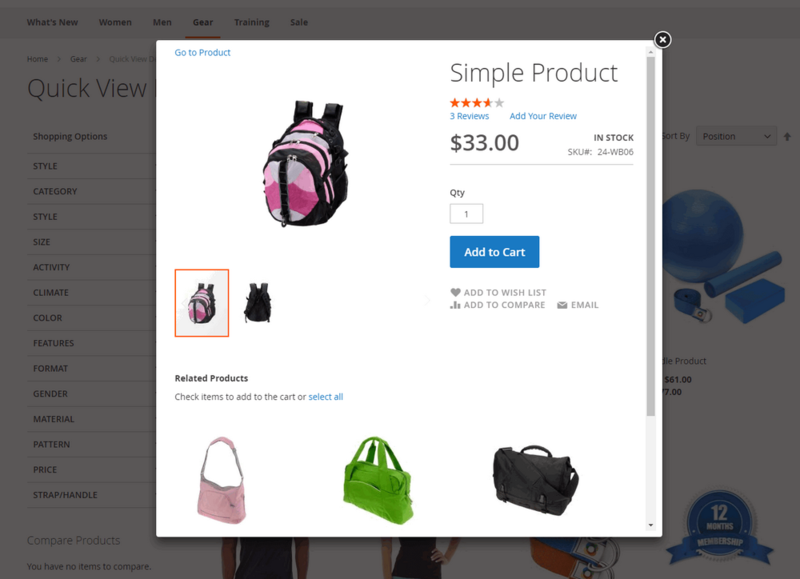 Magento 2 Quick View extension allows customers to conveniently view products in Quick View pop-up without leaving current page. ===> Seeing a small version of one product page with the entire product attributes: name, SKU, prices, product description, and additional information. Shopper will get every necessary information in one place! Also, customers can navigate to product page from the Quick View pop-up by clicking Go To Product link. The “Add to cart” button has reduced two “suffering” action: opening the product page & backing to the product list page. This two “must have” action really keep any users “drained out” while browsing around the shop. “Quick view” has “remove” this issue by allowing “add to cart” right from the pop-up. The shopping process could be faster than ever before with this improvement in customer experiences. Merchants, you can use “Quick view” anywhere on your site. It can be the home page, category page, or cart page, etc. Your product will be everywhere on the shopping online journey of a customer on your site. The elements you will control on the pop-up are: show add to compare, show add to wishlist, show Go To Product link, show reviews and ratings, show additional information etc. Why Quick View for Magento 2 is your must-have extension? Online shopper can browse product list pages “smoothly”, seeing all details in one pop-up blocks cost them just a few seconds to make the buying decision. The pop-up provides all necessary information, at the same time allows adding products to compare/wish list, send email or write review. Products browsing process is speeded up that stimulates customers to decide and finish the deal quicker. This extension adds a small change to the shopping process, at the same time, improving it hugely. Magento 2 Quick View extension is absolutely a cheap deal with wonderful features. Thanks so much! Look forward to other helpful modules. Magento 2 Quick View does work on my site. Just a fancy pop-up box with enough necessary information will be shown! This quick view extension really lives up to my expectation. Quick view popups not only promote customers to add more and more products to cart, but they also make online shopping smooth. Loving it - the installation is free! 1+ like for quick support and free installation service! I will recommend Quick View extension for others. I have come across many Quick View extensions. I download a free one but It didn’t turn out well so I had to remove it. Your extension is my second choice, and it works OK with my site. I especially love the free support and free installation! The extension is easy to use, only 2 minutes to configure and it works like a charm. The module does not cost much, very simple to configure and brings good results! The Quick View popup is exactly what our shop needs. Definitely look forward to other extensions from BSS! All the features work well as described. The price is very reasonable, too. I like how it shows the related product in the popup! I like this extension, especially its feature: Ajax add to cart in Quick View popup. It is pretty convenient for my customer to order our products. Great! 1 like for your module!